Whether you are changing tires, adjusting your valves or installing an aftermarket light, having the right tools is important to success. The right tools make life easier and safer which is why we review tools for our readers. The wrong tools can make jobs take forever and can wreck your bike and your body. Conversely if you have the right tools, tinkering on your bike is fun, relaxing and a big part of motorcycle culture. We review tools because in our daily life as reviewers of products that need installation we need a solid set of tools around to do our job. We’ve found that we started small with a few tools in a basic kit and then over time we upgraded tools and added more pieces as our projects got more ambitious. We suspect that is the normal journey of a bike tinkerer. We hope our tool reviews can offer some guidance on what tools and items you need in the garage to get started as well as which units we specifically recommend. You can see we’ve organized things by group below to help you navigate our reviews. Some motorcycle riders love reading our in depth reviews while others want to skip the details and get straight to the best. We created our top 10 lists with the goal of helping you quickly find great tools we highly recommend. 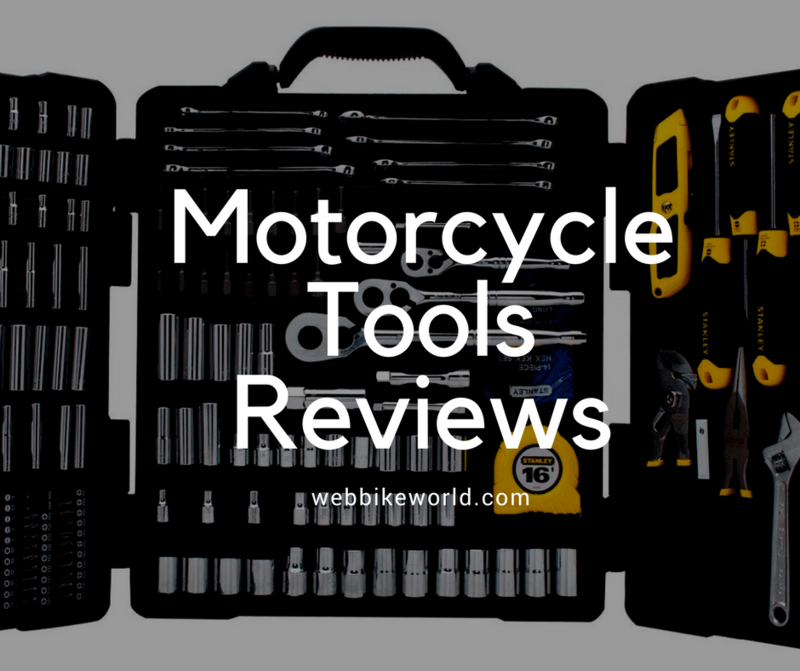 Don’t forget to check out our most recent motorcycle tool reviews here. Ducati and Norton exhaust nut wrenches – spanners available from Machinery Cleanery; they also have all sorts of small brushes that can be used to clean and detail engine parts. Very high quality butane torches for soldering; made in the U.S.A. by Solder-It; can be serviced and rebuilt, unlike el Cheapo “throwaway” versions. Screwgrab Friction Gel is claimed to increase the grip between a screwdriver and the screw by up to 800% to allow removal of screws with stripped heads and “virtually eliminates tool wear and the stripping, rounding or deforming of fasteners”. Flex head flare nut “line” wrenches by Lock Technologyhave a unique flexible head and highly polished surface. Here’s our advice: get the biggest, heaviest, most robust tool you can find for breaking a chain. At least two chain breakers we’ve tried have failed the very first time we used them, so don’t try to save money here, buy the best! The EK chain breaking and riveting tool looks like it’s a very heavy-duty unit. wBW article on replacing a motorcycle chain and sprocket. Motion Pro chain breaker tool at our affiliate, Amazon. Good article on breaking a motorcycle chain and links. Chain breaking tool and master link replacer (we didn’t have good luck with this type either). See the wBW reviews of the Sears Motorcycle Jack. Bike Lift. Handy Industries motorcycle lift. Use discarded motor oil to heat your garage or shop; there are 140,000 BTU’s of heat in one gallon of used oil. Be mindful of local ordinances and safety regulations! Plans for building your own waste oil heater. Lanair waste oil heaters use discarded motor oil to heat the garage or shop in winter. Clean Burn waste oil heaters. The Freeburn “Baby Burn” is a small garage-sized waste oil heater from Harold Electric Co.
Posi-Locks are the greatest thing since left-side shifting! For fans of our webBikeWorld website you know from our Posi-Lock Connector review the Posi-Lock Mini review and our Posi-Tap Connector review that we use Posi-Locks and we love them. Buy them here.